The woman who showed me how to be brave, how to persevere under any circumstance and the one who gave me my vanity, she was known to me as my grandmother… the last grandparent standing. She was the most persistent, pain in the rear and courageous woman I will ever know. Her story is long and treacherous, one that I was lucky enough to hear from her and one that has helped shaped who I am as a human being. She was the first of a slew of children (15 and counting), a common phenomenon of those days, and born under extreme poverty. Somewhere around her 30s after a divorce and 4 children to feed she opened her own restaurant, how she did it still baffles me but she did, she certainly did. It became one of the most popular restaurants of her town in a country called Nicaragua. Yes she loved to cook and cooked well she did…more than well, superb I will say (I remember the days coming back from school looking forward to what she had set on the stove that day, she spoiled us so much, I will miss that so). She ran away from war, she and her children had faced death right in the eye several times and after my mother became pregnant and had me she sold all her stuff, including her beloved restaurant for nearly nothing, packed her bags and left to live with my mother. From there on, she became a permanent soul in our home, she wasn’t the easiest to live with but we got by. My mother became a single parent and that’s when my grandmother became my second mother, she took care of us while my mother had to work day and night to keep us fed. During my teenage years, like any teenager with raging hormones I didn’t really get along with her well, I felt she was possessive and controlling and no teenager likes to feel tied down. It wasn’t until my early twenties that I was lucky enough to realize that she was just looking after me in her own way, I was thankful to have her in my life. I don’t know if it was maturity or a divine revelation but I began to see her with tender eyes, and my feelings for her began to transform into something beautiful. I never thought I would ever feel that way, but I thank god every day for allowing me to have a forgiving heart and opening my eyes and see her for who she was, after all she was human (something I remember learning in one of my favorite reads, and while I am reflecting on this book, Leo had to have been one of the most exquisite people on earth). So the rest of my time with her became more about nurturing her and allowing her to nurture me back, we joked, she shared her stories with me of her grandeur days (I got to know her and realized her heart was that of gold, larger than life) and was the one person who validated my styling expertise. You see every time I came in through that door to visit she never failed to look down at my shoes and at my excessive amounts of accessories. What you don’t know about her yet is that she was vain in a good way of course, and never left the house without her matching bag and shoes. She joked with me that the next time I would come I would lend her the highest shoes I owned and give her a pair of short shorts to hit the town. Those are the things I always treasure, the small stuff, the things that made her special to me. You see you never get over them; they leave heavy footsteps in your mind and heart. That’s the thing about grandparents, their love is unconditional…the most unconditional love you will ever have. If you have been lucky enough to have them in your life than you know exactly what that love feels, it makes you feel peaceful, like a security blanket or a warm cozy sweater. I miss her already and I will never forget the last night I spent with her…I was the last she saw before she went to heaven. 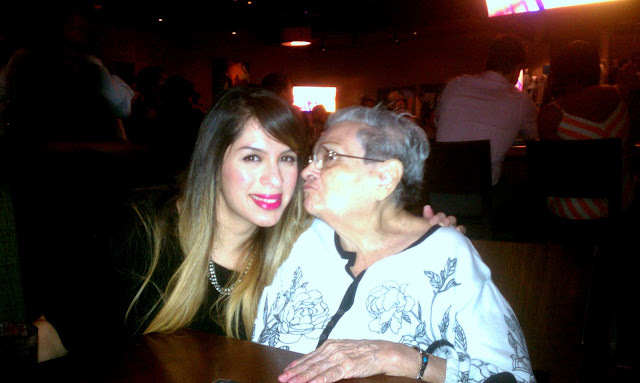 Till we meet again Abuelita, for now I know you will be another angel of mine. Just know I will be coming with highest heels… as promised. To the last grandparent standing, my grandmother Laura who now rests in peace, I love you. This was a great read. It made me think of my beloved abuela. I'm glad you were with her before she left earth and went to heaven <3 May god bless her always. This was beautiful. You're lucky to have had her into your adult years. I am sorry for your loss. So beautifully written, Ana. Grandma would be so proud.